We are so rushed in today’s society that we have little time to stop. Smell the flowers. Watch the wind toss the leaves, observe the squirrels gather nuts, or examine the raindrop that is laying on the blade of grass ready at any moment to fall onto the ground. But most importantly we have forgotten how to watch, listen, touch, and see God and his presents in our lives. I recently had the great privilege and honour to move into the Sisterhood of Saint John Divine Convent as a Companion. I am able for a short time to block out the busyness of the world. Stop the phone from ringing off the hook, stop the tens of thousands of emails that come in most being spam. I am able to slow my pace of life. I am in the beginning of introducing myself to me, to find out who I am and what I need and want out of life. But most importantly being able to reintroduce myself to God and be able to understand his needs, wants, and plans for me. I have been here only since September 9, but in this short time I have watched, observed, and learned to slow down (somewhat) my pace and begin to listen to God’s grace. 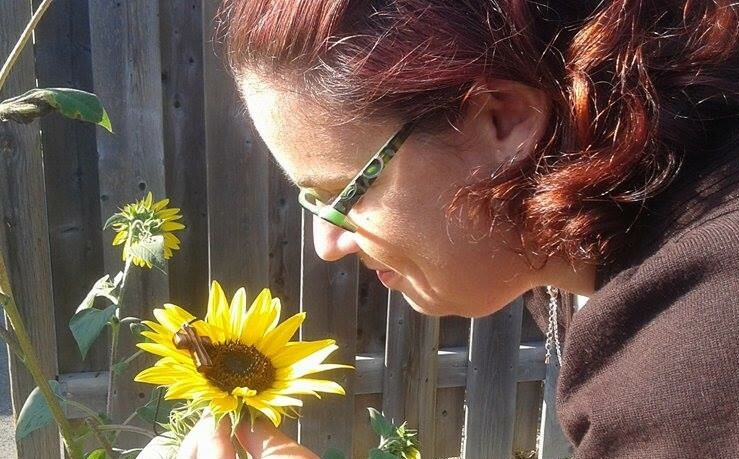 Not to be so fast in going through life that we forget to stop and smell the (sun)flowers. On the way back to the convent after a walk I observed one sister doing just that – stopping and smelling the sunflowers. She took her time, to see the beauty of God’s grace, to stop and investigate, smell, and soak in the beauty of not just one beautiful sunflower but several sunflowers along her path. Knowing that each flower was an individual gift and had its own beauty to be admired. Watching this sister be able to stop all the worries of what she had to do and where she had to go did not bother her. It was taking the few moments and reconnecting in the presence of God in the beauty of the flowers that lined her path. I thought I knew why I came to this program. But I am learning new things, understanding that there are reasons why I am here that I could never imagine. I will learn and understand the important of stopping and smelling the flowers of life. So for just today I will sit with God and not try to figure out what the next 5 or even 10 years of my life will look like. I will not anticipate the what, when, where, when, or why. I will just sit and soak up the Lords presence and know that he is there for me and in his time and his way he will show his great plan for me. Beautiful and such a good reminder. Thanks for sharing! You are learning to “Be still and know…” The wonder of creation and the how the puzzle of life meshes is mind blowing. How wonderful it is to know you are a part of all of this. The opportunity you have been blessed with is worth more than anything you could have imagined. Yes, it will be hard at times when you struggle with homesickness, and discovering the new Amanda. Beautiful things come from and thru difficult emerging! No rush. Continue to take your moments to be still. You are in God’s hands, being moulded by the master potter with love and patience, into a new creation. On this Thanksgiving Day, I give thanks for you, for your friendship, for your courage, for your joy, for inviting me to be apart of it all! May God continue to Bless you in such a special way. I, too, need to ‘stop & smell the flowers’ in my world. Thanks for the reminder that we need God’s peace in order to stay on the path He has ordained for us, & the only way we can find that is to seek Him in quietude..
And this is exactly where our dear Father wants us all to be . . . sitting at His feet and soaking Him in.